BTC - Good 'ol Wisconsin. 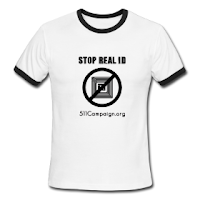 Home to Real ID beneficiaries, Rep. James Sensenbrenner, and technology mavens hell bent on getting babies enrolled with RFID tags. Someone made a sale to a receptive Conneticut hospital. Danbury Hospital in Danbury, Conn. has implemented an RFID system for its child-related facilities in an effort to keep newborns safe and reduce the risk of abductions. The hospital has selected Wisconsin-based RF Technologies Safe Place Infant Security product for this effort. It’s implemented the system on three floors of the hospital, including the family birthing and pediatric units. Safe Place uses water-resistant, lightweight transmitters and the company’s Smart Sense technology in a band that attaches around an infant’s ankle. Staff can then monitor the infants using automated software. If a band is loose, tampered with or removed, the software alerts the staff. @educationny its very taboo to say we have a subliminal currency exchange on data. Its not a level of trafficking we want to admit to. RELATED NEWS:A Future Perspective: Have We Seen The End Of Consumer Privacy In Health Care? "Waiting For REAL ID? 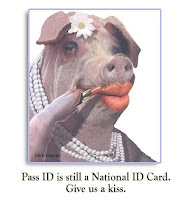 Take a Seat, It'll Be a While"
"The pleasure of watching the endless tug of war over federal (unfunded) mandates versus states’ rights exposed by the REAL ID act is compounded by the risible and ever-changing cost estimates to the states of implementing it. Sensenbrenner originally estimated (i.e., pulled out of the air if not another place) that the cost to change state department of motor vehicle computer systems would be about $2 million per state over 5 years, or $100 million overall. The Congressional Budget Office, sharing the same fantasy, generally concurred, estimating that it would be closer to $120 million over the 5 years total." We honor the great contribution of civil liberties advocate and analyst at the Hit Parader Institute to cover the nuances of State-to-Federal relations and Real ID. Comes complete with hissing in stereo. And I do mean stereo - not iPod. Great thanks to our homies at the Tenth Amendment Center. Tell Boldin to bring his cowbell. NSTIC GETS SKETCHY: One mainframe to Google your DoD authenticated TWIC card? A snub from Dept of Defense PKI admins provoked Biometric contractors to out an online authentication transition.